Our mass texting service prioritizes the ease of instant communication. Consider this. 99% of text messages are opened within five minutes or less. The immediacy of mass texting coupled with the open rates make this method undeniably effective for college and universities nationwide. In case of emergency, you want to be prepared. You need to have a communication system that’s easily accessible and immediate. Why not give text messaging a try? In an emergency situation, staff can text out specific instructions that lead everyone to safety. This is not a drill. Please evacuate campus immediately and stay by your phone for further instructions. Who doesn’t love a snow day? Keep everyone in the loop with our mass texting solutions. In the long run, this ensures on campus safety and keeps all students in the loop. Due to extreme weather conditions, all classes are cancelled today, 1/27. Big home opener? Rally up support by shooting out an encouraging message. Provide event time and location info, at the bare minimum. It’s the homecoming game! Kickoff is tonight at 7PM on West End Field. Let’s be honest. Most campuses house thousands of students. And it goes without saying, the majority of these students rely on a mobile device. On top of that, most keep it within arm’s reach. As a whole, we always recommend catering to your audience’s media habits. 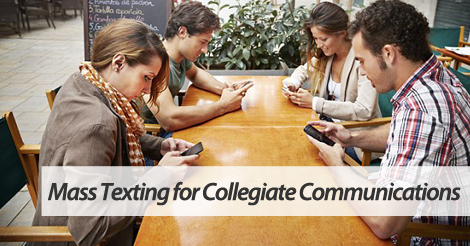 When comparing the benefits of mass texting to the usage statistics, it’s easy to see why this is a great solution for colleges and universities. Partner up with top mass texting service, SlickText.com. Give us a buzz today at 1.800.688.6290 or head over to the pricing page and sign up for a free plan. Not a phone person? That’s totally cool. Shoot us an email at info@slicktext.com. Our feature rich platform always puts you first.